On New Years Day, John 5 and The Creatures released the first single/video from his forthcoming album Invasion. ZOINKS! written and directed by Disney animator Brett Boggs (Frozen, Wreck-It Ralph), with live footage shot by Matt Zane, is in the tradition of Scooby Doo and Groovie Goolies. The new single is part of a series of music videos releases just like 2017’s Season of the Witch. Invasion, the new full length album is due out in Summer 2019. It has been produced and mixed by Barry Pointer. Ultimate-Guitar.com have named John 5 as one of the Top 15 Most Innovative Musicians of Today. The Top 15 includes John Frusciante, St. Vincent, Mike Patton and Tosin Abasi and is compiled from a list of discussions and voting from within the UG community. Did you see it? Did you watch ZOINKS! as it went LIVE across the globe!? ZOINKS! the new video from John 5 and The Creatures received its premiere on YouTube this New Years Day. Fans watched, streamed and chatted with each other about it as it went live! [WATCH] John 5 discovers the Fender Troublemaker Tele in their blindfold test! We blindfolded John 5 and had him try to guess what guitar he was playing. Check out what he thinks about the brand new Trouble Maker Telecaster – part of 2018’s Parallel Universe Series. Watch the trailer for ZOINKS! the new John 5 and The Creatures single coming New Years Day! This video has been in the making for six months and on New Year’s day it will premiere on my YouTube channel. Zoinks! is the first single and video from my new album Invasion, out 2019. Watch the trailer above and go here: youtube.com/watch?v=1uWAGs10D6Q and click “Set Reminder” to watch the video when it goes live! Thank you to this incredible team that worked with me: Brett Boggs who did the animation, Matt Zane who did the live footage, Fred Coury who did the score music with me. Thank you to also Rita, Nikki Sixx, Susan Olsen, Fred Coury and Jess Harrell with the incredible voice overs. Also Chuck Duran for voice producer and Barry Pointer for producing and mixing this album he’s worked as hard as I have. To see the video as soon as it goes live, go here: youtube.com/watch?v=1uWAGs10D6Q, click “Set Reminder” and let YouTube tell you when it’s live! Bid on these rare items from John 5 to benefit two of his favorite charities. John 5 has teamed up two of his favorite charities, Rock Against MS and Fur and Feathers Animal Sanctuary and is giving fans the chance to bid on TWO different guitars signed by John 5. Fans will also be able to get hold of a classic collectible John 5 poster which he will sign with a personal message to you. And to top it all off, fans will have a chance to bid on his first original prototype guitar strap by Red Monkey as well as other goodies. Auction One: JOHN 5 Signed Guitar + Classic Collectible J5 Poster Signed To YOU! The guitar on this lot is black w/black pick guard – The brand is a Memphis – The poster is hard to get and he will sign a personal message just to YOU”. Auction Two: JOHN 5 Signed Guitar & Classic Collectible J5 VERTIGO Poster Signed to you! Auction Three: JOHN 5 GUITAR STRAP PROTOTYPE By Red Monkey, J5 Calendar w/rare photos & Poster! “JOHN 5 has donated his first original prototype guitar strap by Red Monkey as well as his 2011 calendar with rare photos and the very last REQUIEM poster, which he will sign to you personally!! Please note: If you have any questions please contact the seller at the eBay auctions. On August 31, 2004, John 5 released his very first solo album to the world: Vertigo. The album was a mixture of the infamous Drop-D tuning style 5 was already known for, and his love for Bluegrass. 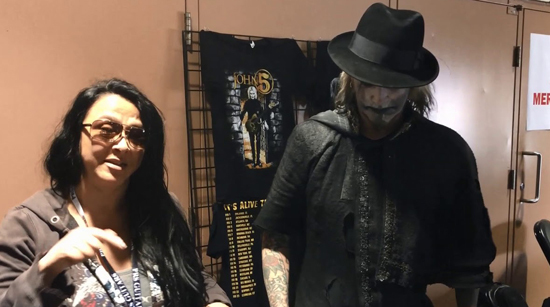 The different styling brought a whole new type of fan to John 5’s work as well as enthralling existing fans who appreciated the different styling. *Please excuse the low-quality of the video. We had to track down a copy of it ourselves, and rip it from the CD, to put back up online. Steve Perry, ex-Journey singer, is back with a brand new solo album “Traces“. It is his first album in 20 years. John 5 will appear on that album with a track co-penned with Perry and Thom Flowers called “Sun Shines Gray“. The album comes out October 5 via Fantasy Records (a division of Concord Records/UMG). ROCK WITH JOHN 5 AT FANTASY CAMP LAS VEGAS! Please note: John 5 will only be appearing at RnRFC on October 4th. Imagine – YOU…On stage…Jamming with rock legend Paul Stanley of KISS in LAS VEGAS at House of Blues! Plus jam with Paul, along with Tommy Thayer of KISS, Rudy Sarzo of Quiet Riot, John 5 of Marilyn Manson and Rob Zombie and Tommy Aldridge of Whitesnake and Ozzy Osbourne at the private Rock and Roll Fantasy Camp facility in Las Vegas! Attend this camp and stand at the top of the rock and roll mountain with all of these rock and roll icons! You will jam live at the Rock and Roll Fantasy Camp facility with Paul Stanley, Tommy Thayer, Rudy Sarzo, John 5 and Tommy Aldridge and then Paul Stanley will perform with you live at House of Blues in Las Vegas! This is NOT a competition; It’s not a reality show. It’s simply reality. It’s YOU… face to face, with the rock stars that have created the sound track of your life…and YOU get to play with THEM! All skill levels are respected and welcome. Learn & grow in ways you never thought possible! Rock and Roll Fantasy Camp takes place on OCTOBER 4 – 7, 2018 • LAS VEGAS, NV. John 5 has been busy recording voices for an animated video currently in the making for John 5 and The Creatures. Yesterday he was joined by his wife Rita, Nikki Sixx, Fred Coury and Susan Olsen as they began tracking. Get your hands on this special edition, very limited number, John 5 latex mask. Orders will begin shipping in May.